The drama between Danielle Staub and Marty Caffrey, her husband of 2 months, has escalated. She went from admitting to “difficulties” in their marriage, to having not one, but two birthday events without her man. Those are all debatable red flags, but there’s nothing at all debatable about Marty’s latest statements about their relationship. He wants out. Not only that, but he has lot of defamatory accusations aimed toward the Real Housewives of New Jersey cast member. 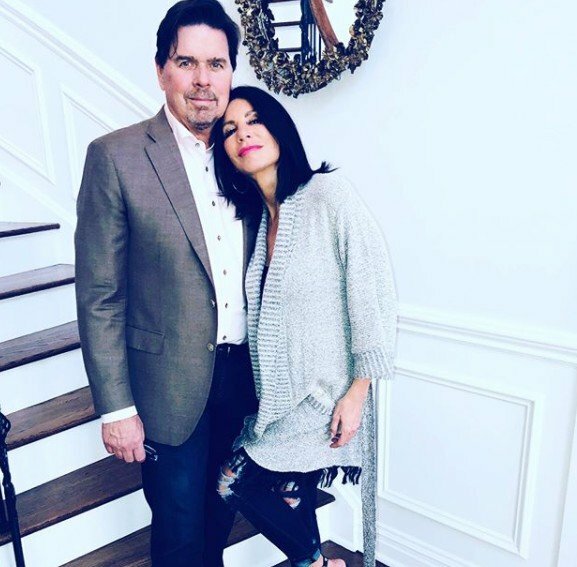 On July 28, Marty told RadarOnline, “Marty Caffrey is divorcing Danielle Staub.” Hopefully he did not actually speak in the third person and representative just said that on his behalf. In a statement that was released to RadarOnline on July 31, Marty shared his very detailed perspective on the relationship. He claimed to suffer from “financial, verbal, and emotional abuse.” He also claimed that he cancelled his credit cards after the “abuse” suffered by his bank account. Marty even took some credit for Danielle’s reality TV comeback. He said, “I bailed Danielle out of a really tough situation. I gave her a platform to be relevant again. Because I believed in her and loved her. I still love her and still believe in her. And her payback is nothing but financial, verbal and emotional abuse. I’ve tried dozens of times to talk to Danielle about this but she just buries her head in the sand.” There’s no better way to alleviate marital difficulties than by issuing public statements….. right? In that same RadarOnline interview, Marty claimed that Danielle “didn’t like” his children, a sentiment that he explained in an interview with Us Weekly. He. Had. Time. Marty said, “I kept on dating her, proposed to her and then married her. She won! But she offers no path forward to allow my children back into my life. Yes, I see them, but I do it alone and not with my wife. There has to be a middle ground.” Why were the kids out of his life? There are so many unanswered questions and so much drama that goes beyond “difficulties” in a two-month marriage. Is Danielle Staub Divorcing After 2 Months Of Marriage? How much of this will be shown on Season 9 of Real Housewives of New Jersey? Danielle is not a expected to be a full-time cast member (yet again), but she did reportedly film the wedding for the show and she had Teresa Giudice, Melissa Gorga, and Margaret Josephs as bridesmaids. It would make sense for her relationship to be a part of her story line, but who knows? Last season her proposal wasn’t even a part of the regular episodes. Instead, it was shown in a “Secrets Revealed” episode that aired after the reunion episodes wrapped up. TELL US- WHAT IS YOUR REACTION TO MARTY’S CLAIMS ABOUT DANIELLE? WILL THEY BE ABLE TO WORK OUT THEIR DIFFERENCES OR ARE THEY DONE FOR GOOD? DO YOU WANT DANIELLE TO BE A FULL-TIME CAST MEMBER NEXT SEASON?